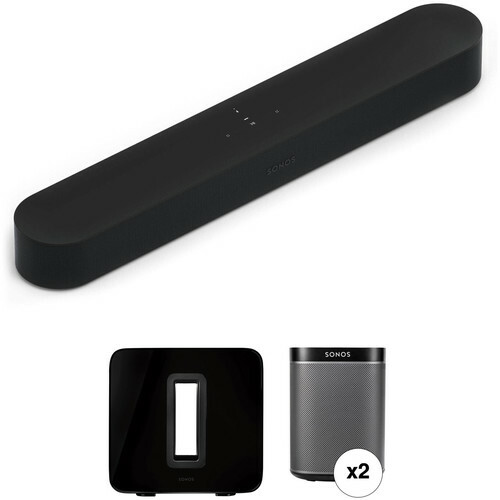 Enhance your display's audio, interact with Amazon Alexa or Siri, and expand your Sonos ecosystem with this B&H Kit of the black Sonos Beam Soundbar and the black SUB Wireless Subwoofer. They connect to each other wirelessly to create a virtual surround experience, and the soundbar provides Amazon Alexa functionality and Siri compatibility. The subwoofer features flexible placement options, in that it can be stood upright or laid flat under a piece of furniture. As part of the Sonos ecosystem, you can wirelessly connect additional Sonos speakers to create a multi-room system where you can stream the same music throughout the house, or choose what plays where with the Sonos app. Enhance your display's audio, interact with Amazon Alexa or Siri, and expand your Sonos ecosystem with the black Sonos Beam Soundbar. It features a five-driver design powered by five discrete Class-D amplifiers, plus five far-field microphones that enable Amazon Alexa voice control and Siri compatibility when paired with compatible devices. The Beam connects to the Internet over Wi-Fi or through the Ethernet jack. The soundbar comes pre-loaded with thousands of free Internet radio stations that you can listen to without even turning on your computer. You can also stream audio from a variety of other sources including your smartphone, tablet, or other compatible mobile device. And, you can download the free Sonos Controller App and turn your iOS or Android mobile device into a convenient remote. The app will work with your computer as well. Five far-field microphones detect your voice from any direction, anywhere in the room, even with loud music. Upgrade your audio while streaming, watching TV, or playing video games. You can also stream from any of the music services supported by Sonos. At only 25.6" long, the Beam won't hang off most furniture or block your TV. Just plug the Beam into power, then connect it to your TV using the HDMI cable. The four mid-woofers and one tweeter are designed to harmonize low and high frequencies. Three passive radiators help intensify and deepen bass, mitigating the need for an accompanying subwoofer. When the microphone LED is on, Alexa is ready for a voice command; when the light is off, the microphone is off. Play a movie in the living room, a podcast in the kitchen, or the same song everywhere when you set up multiple additional speakers. The Beam's compact design makes it well suited to rooms when you're short on space. Place the Beam on your TV stand or hang it from your wall with the optional wall mount. Since the Beam is part of the Sonos ecosystem, you can add more speakers to fill every room in your home with sound. Turn on the speech enhancement feature to hear clearer dialogue. Enjoy late-night TV without waking the whole house. Pair the Beam with your remote to control your compatible display with your voice. Control the Beam with your voice, the Sonos app, AirPlay 2, or the app for your favorite music service. 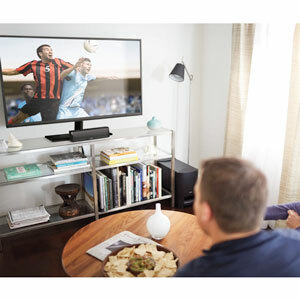 Create a full home theater system when you wirelessly connect an optional pair of rear speakers and a Sub. Plug the Beam into power and connect it to your display via HDMI. If your display isn't ARC-compatible, use the included optical audio adapter instead. Add more bass to your existing Sonos setup with the gloss black Sonos SUB Wireless Subwoofer. It connects to your system via Wi-Fi or Ethernet and has a built-in extender for SONOSNet 2.0 connectivity. The SUB works will all Sonos amplified components and features two Class-D digital amplifiers that power two force-cancelling face-to-face-mounted drivers that are designed to reduce unwanted cabinet resonance. The black Sonos PLAY:1 Compact Wireless Speaker has a graphite grille and lets you stream music from a variety of sources. It connects to your home network via Ethernet, or via built-in Wi-Fi. Once connected, you can stream music from iTunes or another personal music library. You can also stream music from thousands of free Internet Radio stations or from virtually any online music service including Pandora, Spotify, Rhapsody, and many more. You can also stream music from other network connected devices like your iPad or iPhone. The PLAY:1 works on its own as a single speaker, but it also supports left/right stereo separation when paired with another PLAY:1 speaker in the same room. If you're more ambitious, you can fill every room in your home with any combination of Sonos speakers. And since all Sonos products support SonosNet wireless mesh technology, they all work seamlessly with one another. For instance, if you have a PLAY:1 connected in your room and you add three other Sonos speakers in different rooms, the wireless SonosNet technology will link all four speakers together. Once they're all connected, you can simultaneously stream different music to each room/speaker or stream the same source on all four speakers and listen to one song in every room throughout your entire home. Whether you're playing music on a single PLAY:1 in your bedroom or streaming different music to multiple rooms, the free Sonos Controller App is what ties the entire system together. The app allows you to control your PLAY:1 and additional Sonos speakers from anywhere on your network. It also makes setup easy and it allows you to control multiple Sonos speakers in different rooms simultaneously. You can even adjust the volume for each speaker individually or collectively. The app is available for iOS, Android, Windows, and Mac. The PLAY:1 speaker employs a mid-woofer and a tweeter, which are powered by independent Class-D amplifiers. The result is warm, full-range sound with clear highs and powerful bass. The speaker also has a ¼"-20 standard thread on the back that makes it compatible with most wall-mounting brackets. The PLAY:1's other features include convenient top panel control buttons and a humidity-resistant enclosure that can withstand high humidity so you can keep the speaker in the bathroom - even while you shower. The PLAY:1's 3.5" mid-woofer and tweeter both feature dedicated Class-D digital amplifiers that afford warm and rich full-range Hi-Fi sound. The mid-woofer provides deep, powerful bass and mids, while the tweeter yields clear highs. The PLAY:1 is an independent speaker unit, but it is also a building block designed to connect seamlessly with any other Sonos product. Since all Sonos speakers work together, you can add more products over time to create a complete and totally wireless home audio system. If you do add additional speakers, you'll be able to stream the same song simultaneously throughout your home or different music to every room. The PLAY:1 and all other Sonos products use built-in SonosNet technology to establish their own secure wireless mesh network that also works with your Sonos app-enabled iOS/Android/Windows/Mac controller devices. This network provides whole-house coverage, synchronous music playback and protection against wireless interference. The SonosNet system also incorporates sophisticated MIMO (multiple input, multiple output) technology that uses multiple antennas and radios to boost signal strength. The free Sonos Controller App makes it easy to setup and control you PLAY:1. It also supports additional Sonos speakers and multi-room control, so you can manage and operate a whole-house Sonos setup with just your smartphone. The app will work from anywhere on your network and it's available for iOS (iPad/iPhone), Android mobile devices, Windows computers, and Mac devices. With the Sonos Controller App and your PLAY:1 speaker, you can to wirelessly stream music from your iTunes library or Windows Media Player personal music library. You can also stream music from thousands of free Internet Radio stations or online music services (without turning on your computer) including Amazon Cloud Player, Deezer, iHeartRadio, Last.fm, Napster, Pandora, Rhapsody, SiriusXM Internet Radio, Slacker Radio, Spotify, Stitcher SmartRadio, TuneIn, and more (some services require subscriptions). If you want to listen to music and enjoy movies/TV with true 2-channel stereo separation, all you need is an additional PLAY:1 speaker. Linking two PLAY:1 speakers together in the same room will create a stereo pair with separate left and right channels. The result will be a richer, more immersive sound. Create a complete 5.1-channel surround sound system by pairing your PLAY:1 speaker with an additional PLAY:1 Speaker, a Sonos PLAYBAR, and a Sonos SUB, all sold separately. This optional setup supports true 5.1-channel surround sound for immersive entertainment that will transform your living room into a complete home theater. Plus, it all works together wirelessly and can be set up in a matter of minutes. The PLAY:1 will fit just about anywhere in your home thanks to its compact size, integrated ¼"-20 thread for wall mounting and custom designed power cord. The speaker's continuous curve grille supports a wide listening range as well, which affords even greater flexibility. If you don't have your smartphone or tablet nearby, you can easily control the PLAY:1 by using the buttons located on the top panel of the device. Pressing the Play/Pause button once will start or stop the music and pressing it twice will skip to the next track. The top panel also has volume up/down controls. The PLAY:1 comes equipped with a standard ¼"-20 threaded insert for connecting to most standard wall-mounting brackets. The PLAY:1 is designed to withstand humidity so it can survive in your bathroom - even while you're taking a shower. However, it is not waterproof or water-resistant. Box Dimensions (LxWxH) 31.0 x 10.5 x 6.5"
Box Dimensions (LxWxH) 9.5 x 6.9 x 6.8"